A process to fabricate aromatic compounds from materials such as wood or plastic wastes using fluid salts instead of rapidly depleting petroleum resources has been developed by Germany’s Fraunhofer Institute for Chemical Technology ICT. 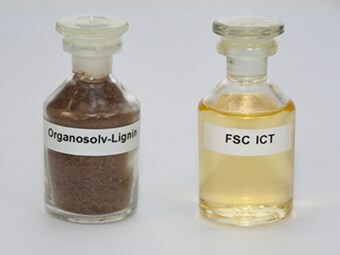 Typical feedstock organosolv-lignin (a natural material containing polyaromatic compounds), developed by the Fraunhofer Institute for Chemical Technology ICT and the mixture of aromatic hydrocarbons obtained from this feedstock using a fluid salt cracking (FSC) process. Researchers say this could be a turning point in the supply of an entire category of materials, meaning that consumers will not have to do without day-to-day products such as plastic bottles and Aspirin in the future. "At present aromatic hydrocarbons are mostly produced through petrochemical processes," the institute says. "They are generated in a steam cracker or fluid catalytic cracking unit during the production of ethylene, and typically contain the compounds benzene, toluene, ethylbenzene and xylene. This mixture is known as BTEX, or the aromatic fraction. "Based on these substances, and using a variety of chemical reactions, a broad spectrum of compounds can be produced, which in turn can be used to fabricate medicines, plastics, paints and numerous other products we use on a day-to-day basis." This research is urgently needed, it adds, in light of fossil fuel depletion, the increasing difficulty of accessing remaining reserves and the decreasing quality of the raw materials extracted. Of particular interest to the researchers are ‘drop-in’ solutions which allow new raw materials to be processed using existing production lines in order to manufacture end-products identical to those already available on the market. The mixtures produced using the Fraunhofer ICT's new process contain numerous aromatic compounds. "The chemicals in the product mixture are mostly benzene, toluene, ethylbenzene and para-xylene, but there are also significant quantities of styrene and naphthalene," project leader Jochen Forstner says. "Gaseous by-products include hydrogen, alkenes and alkanes, which are also important in economic terms." These are the initial raw materials needed to fabricate further chemical products, such as plastics and medicines, and are in increasing demand.